What do you call someone who takes a week’s vacation, travels across the country to the Napa Valley in California, goes from winery to winery tasting wine after wine? A connoisseur. What do you call someone who takes a week’s vacation, travels across the country to the hills of Kentucky, goes from distillery to distillery tasting bourbon after bourbon? An alcoholic. Bourbon is one of the true American spirits. We cannot claim wine or beer, scotch or vodka, tequila or rum. So why is it not at the forefront of our drinking and cooking experience? While I cannot answer that (I rarely drink it myself), I have sought out recipes to cook with it. This could be due to the fact that I had purchased a bottle for a guest several years ago and it was still occupying space on my liquor shelf. 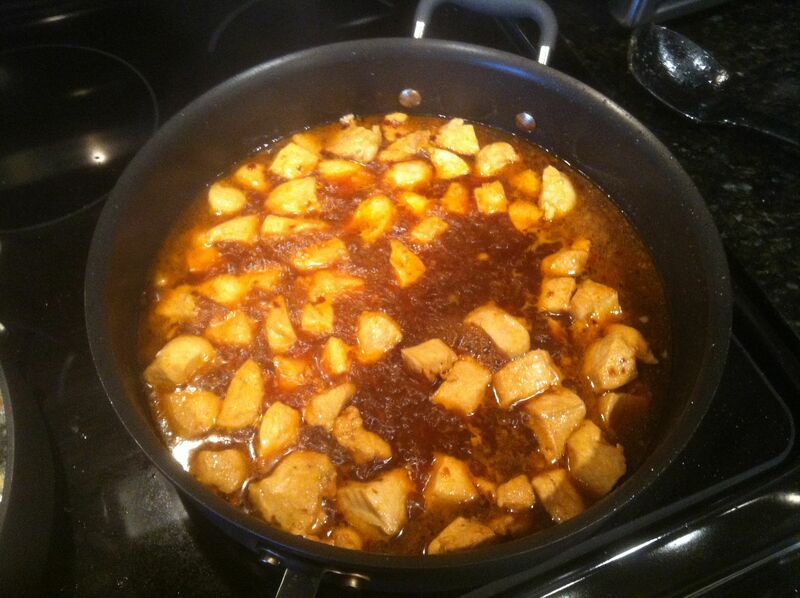 I ran across a recipe for bourbon chicken (a staple at Chinese restaurants in shopping malls) and thought it may be a good way to use some of my stock. WRONG! 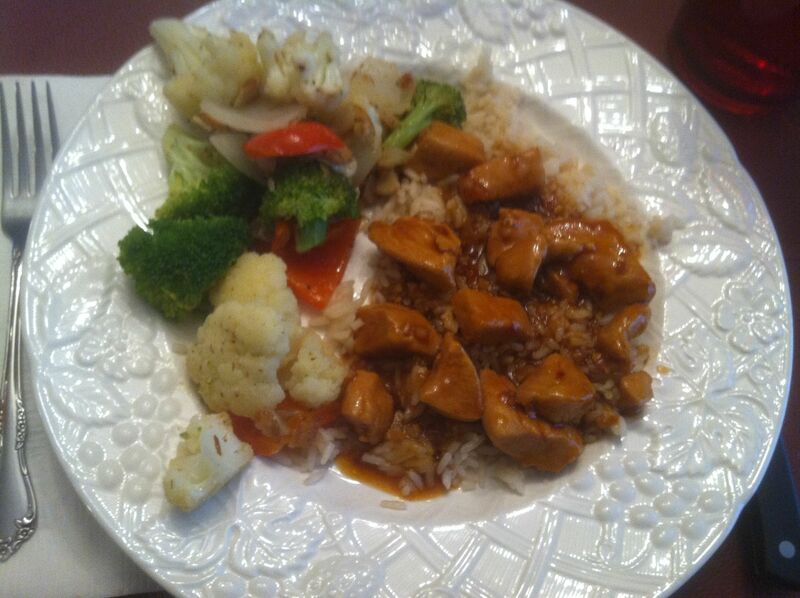 Can you believe the bourbon chicken recipe did not call for any bourbon?? Not a drop. What a crime. I added a splash (or two) on my own. With it, I figured a nice selection of vegetables would be a tasty side. I served the chicken on a bed of white rice for those eating the carbs. I would say this dish was great. I will be making it again soon. The inspiration for the dish. Cut up the chicken and fry it up in some oil. Add the other ingredients to form the sauce and cook for a while longer. 2. 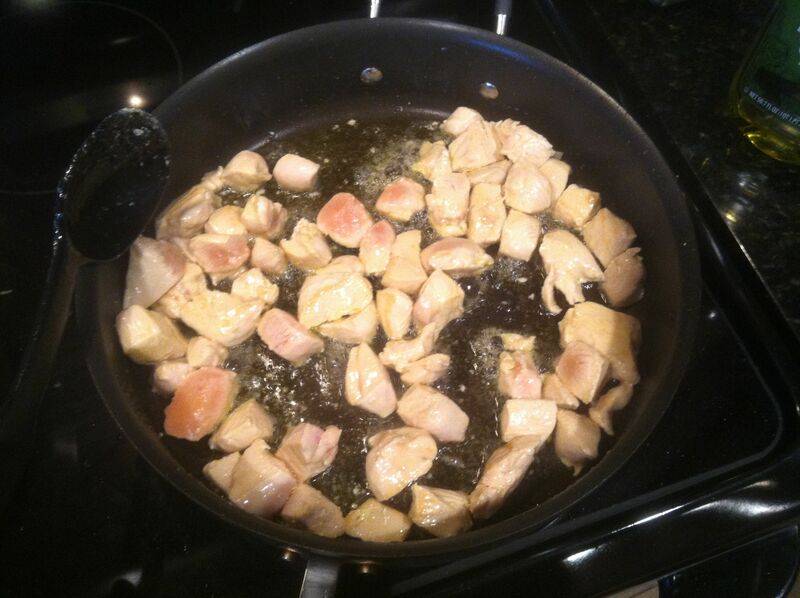 Add chicken pieces and cook until lightly browned. 4. Add remaining ingredients (here I added 1/4 cup of bourbon and reduced the water I added to 1/4 cup). Heat over medium until well mixed and dissolved. 5. Add chicken and bring to a hard boil. 6. Reduce heat and simmer for 20 minutes. 7. Serve over hot rice and ENJOY. 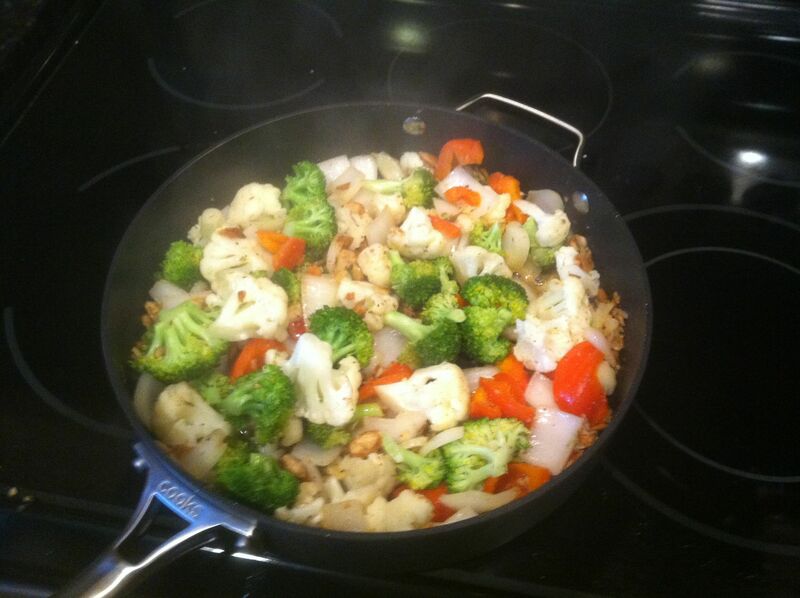 I rarely make mixed vegetables unless in a stir fry, so this was a nice variation. 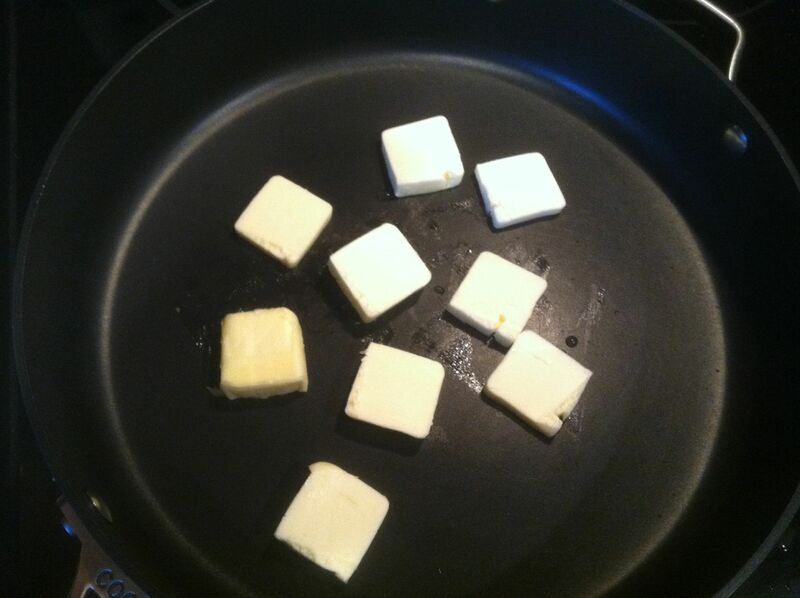 Slicing the butter thin will help it melt faster. 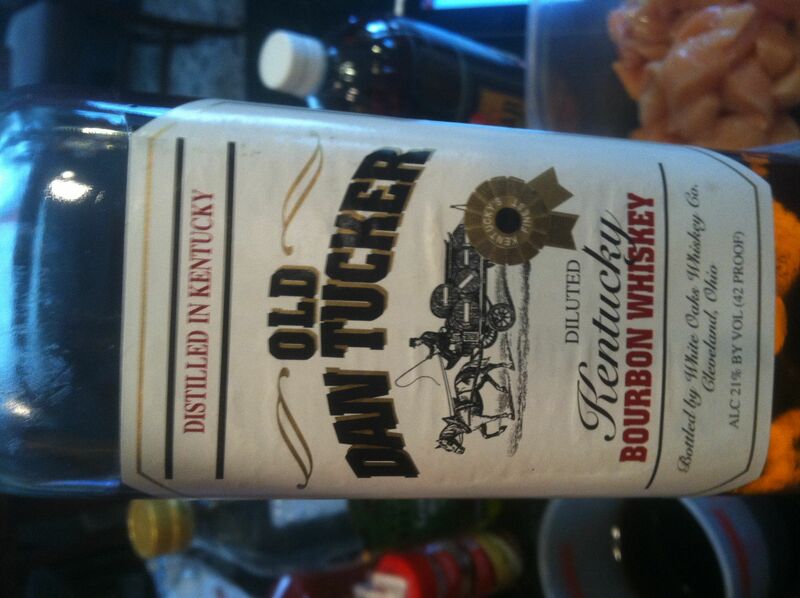 My boys have been singing a folk song that contains the lyrics “Old Dan Tucker.” I didn’t know what it was until seeing your post! We will have to make this recipe and tell them about it! Can you use chicken parts with bones instead of boneless? If you did, your cooking time would need to increase as the meat close to the bone won’t cook as quick until the bone gets equally hot. I think you could debone or use boneless thighs or other parts well. Pray tell, how did it get the recipe Bourbon Chicken ? This is my all-time favorite Chinese dish! I judge a restaurant solely on the quality of their Bourbon Chicken. Thanks for the recipe. Mmmm bourbon. 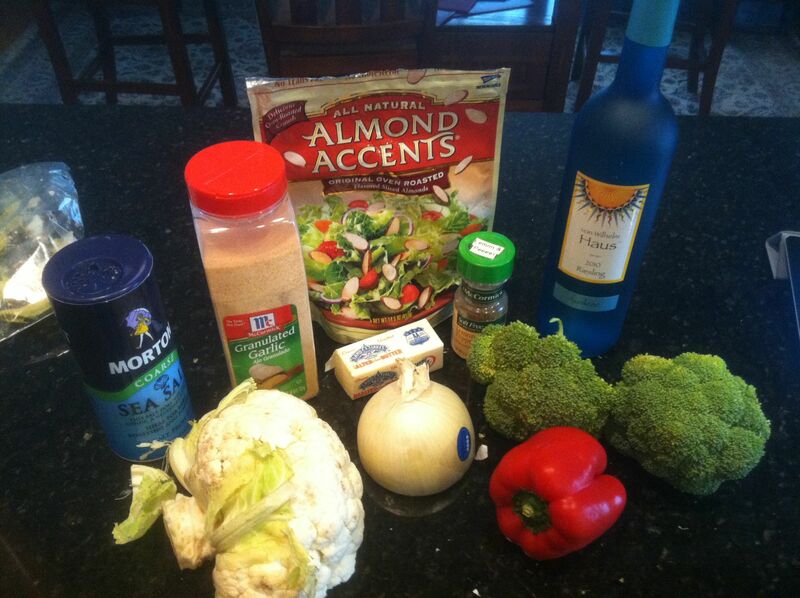 What a great reminder to add it to my cooking..
You can not go wrong with this. I am going to add this to my menu. Looks tasty! The apple juice will add too much sugar for my tastes though. Is it essential or is there a replacement for it, or can I just skip it all together? Sure. If I were skipping the juice to make it not as sweet, I’d up the cider vinegar a little, maybe put in a little lemon juice and the rest water. This sounds delicious! I enjoy bourbon…though I don’t drink it very often. I would love to see it make more appearances in food. Which is why I took the liberty of adapting a pecan pie receipe to include some Jim Beam Black. I’d love to share it with you if you’d like…. Try throwing that bourbon in a bag with some salmon, brown sugar and seasoning. It is awesome! Loved looking at your blog. I’m a Kentucky girl … driving to the Bourbon Trail to drink bourbon all day does not make you an alcoholic—It makes you an honorary Kentuckian! Hope you enjoyed it! Love that you include even nutritional facts! Thanx for dropping by my blog yesterday! Another way to “get rid of” the bourbon is adding some to Pecan Pie with Chocolate Chips….that’s a sweet way to drink (I mean eat!) your dessert. Thanks for stopping in to visit our blog! “What do you call someone who takes a week’s vacation, travels across the country to the hills of Kentucky, goes from distillery to distillery tasting bourbon after bourbon?” Me! My husband and I did that trip last fall and it was amazing. I am now a huge bourbon fan. For my last bday, I made a Chocolate Bourbon Cake:-) Want to return next Sept for the Bourbon Fest. Thanks for the shout-out to bourbon and for what looks to be a great recipe. Weird that you had to add the bourbon to Bourbon Chicken. ?? Chicken recipe looks great! Except I don’t have any bourbon and we wouldn’t drink it if I bought a bottle. I have light rum, vodka, vermouth or white wine. Any idea what would be a good substitute? Or should I buy a small bottle of bourbon? While chicken works well with vermouth or wine and you can make some sauces with vodka and glazes with rum, the flavor would be very different. I would not substitute any of those for bourbon in this recipe. Wow, never thought of using Bourbon for every day cooking. I only use it once a year for my Thanksgiving meal. Reading your blog I wondered why? I use wine and other spirits all the time. Thanks for the reminder! Love the intro to this post. I’m not a bourbon drinker, but it’s definitely got some nuance and interest. More than people give it credit for. My husband would probably love to be labeled a connoisseur for his bourbon appreciation. Yummy! This looks awesome. About a year ago, I went to Kentucky and I picked up some Kentucky Trail bourbon (something that we don’t have in Hawai’i). I wanted to cook with it and I think this is the perfect recipe for it. Thanks for sharing. I’ll let you know how it goes! Dang this looks amazing! Do you think it would taste better with rice or noodles? I think either would work. I use rice as it tends to soak up the rich sauce. Feed the stomach and the soul at the same time! Baseball and food, two of my favorites! I am bookmarking your blog! Thanks for stopping by my baseball blog! I am currently in NH working here is week but when I get back to Cali, I will buy some bourbon and try this. Thanks! This recipe must have strong flavor! I like that! Browned Butter Vegetables with Almonds looks SO GOOD!! i love alllll kinds of veggies and that could easily be my fave! 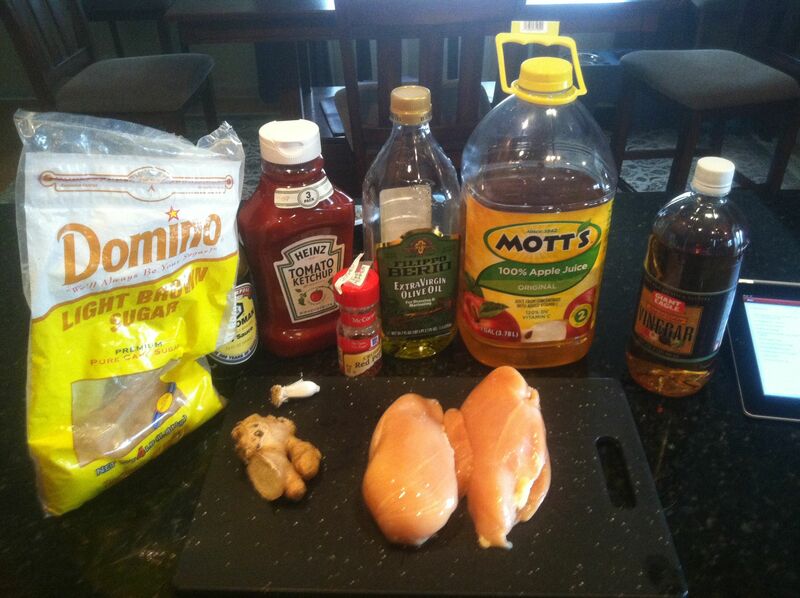 adding Bourbon to chicken… great idea! Oh man, this looks and sounds delicious. It’s tough reading this blog while I’m stuck at sea. About four out of six of my food options each meal are deep fried. Howdie there, I just felt the urge to state how cool I find this blog!